It has been cold here, polar vortex and single digits and all that winter fun. It's the time of year when I enjoy soup, unlike my husband who thinks soup is great all year long, even when it's 95 degrees out. 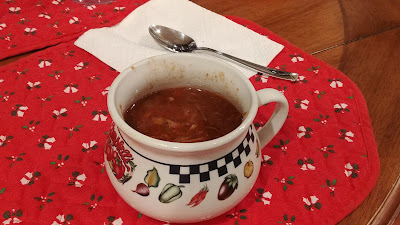 As you can see from the photo, we actually made this soup back in December. I've been craving barley soup and this week we actually made Graupensuppe but I think I like this Beef & Barley Soup even more than I like the graupensuppe. I think it's time to make it again. 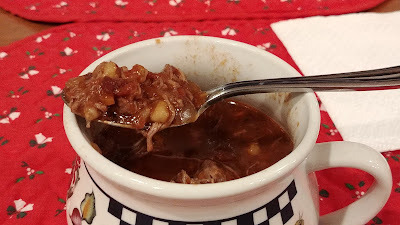 This version of Beef & Barley Soup from The Make Ahead Cook (America's Test Kitchen) is delicious. Warm, hearty, filling. It's also super easy because it's made in a slow cooker and there's pretty much no prep work/cooking - everything just goes right into the slow cooker. No need to cube the meat. No need to saute the meat and/or vegetables. Chop an onion. Mix it with some other ingredients in a bowl & microwave about 5 minutes until the onion is soft, then pour into the slow cooker. Stir in some other ingredients. Season the beef blade steaks and nestle them into the slow cooker. Cook. After it's done, you remove the beef, shred it, and stir it back into the soup. Definitely a soup we'll make again. I really liked that the meat is so tender and that it's shredded. The barley makes it hearty and filling. Onions, carrots, and tomatoes for veggie. Soy sauce for some extra flavor. So easy and so yummy. Recipe here. Our recipe microwaves the onions, tomato paste, vegetable oil, and thyme, stirring occasionally, until the onions are softened, not sauteing in a skillet. Ours also calls for only 1/4 c dry red wine. We used beef blade steak, which shredded nicely.